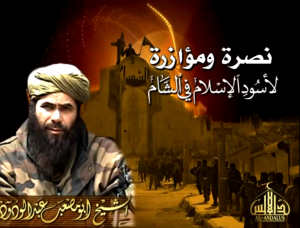 The emir of al Qaeda in the Islamic Maghreb (AQIM), Abdelmalek Droukdel, has released an audio message praising the jihadist coalition that took control of the city of Idlib late last month. The audio statement is nearly four minutes long and it is read while a picture of Droukdel is displayed on screen. 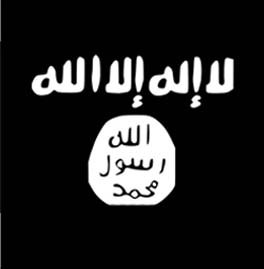 The background of the image shows a jihadist standing triumphantly on top of a building in Idlib. A screen shot can be seen above. 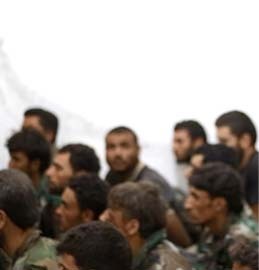 Addressing the “mujahideen brothers in the Levant,” Droukdel says their “victories were truly grand, and will continue to be grand.” But they will be even “grander” if they remain unified and “refrain from looting.” The latter is most likely a reference to the guidelines the jihadists put in place after they forced Bashar al Assad’s forces out of the city. Jaysh al Fateh, the coalition that beat Assad’s fighters and their allies, forbade its members from plundering the city. The coalition’s guidelines were reinforced by prominent commanders in the alliance, including the Al Nusrah Front’s emir Abu Muhammad al Julani. Droukdel says the jihadists’ victory comes “after decades of Nusayri [a derogatory reference to Bashar al Assad’s regime and its Alawite supporters]” rule and “corruption.” Moreover, Droukdel says, the jihadists have dedicated themselves “to spreading and achieving Islam’s justice” instead of fighting among themselves over border crossings and territory destroyed by Assad’s “barrel bombs,” or the “crusader coalition’s” missiles. Droukdel wholeheartedly endorses the statement made by Julani shortly after Idlib fell. 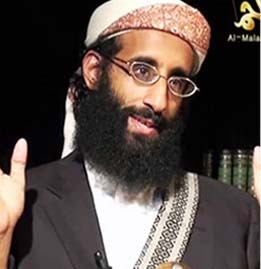 The AQIM emir says Julani’s words were “full of wisdom,” “modesty” and “brotherhood.” The jihadists should make “it the basis” of their work, Droukdel advises, and they should put “the interests of [their] people and ummah before the interests of organizations and groups.” The “interest of Islam and sharia” law should be “above the interests of all other entities,” because organizations are “simply a way to realize the” end goal. In addition to Al Nusrah, the Jaysh al Fateh coalition includes Ahrar al Sham, Jund al Aqsa, Liwa al Haqq, Jaysh al Sunna, Ajnad al Sham, Faylaq al Sham, and others. Coordinating all of these groups’ fighters to take the city of Idlib from multiple directions was undoubtedly a major undertaking. The Al Nusrah Front, an official branch of al Qaeda, regularly works with other rebel groups, including jihadist organizations that have their own links to al Qaeda. But the establishment of Jaysh al Fateh was a significant development. Members from various constituent groups have called for the coalition to stick together and continue to take the fight to their common enemies. On April 7, Abu Issa al Sheikh, a high-ranking member of the Islamic Front’s shura council, posted a tweet encouraging the Jaysh al Fateh coalition’s members to become more than a joint operations room. The Islamic Front is headed by the al Qaeda-linked Ahrar al Sham, which also belongs to Jaysh al Fateh. 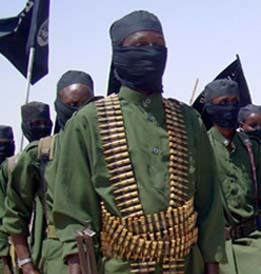 Abu Issa argued that the coalition must become “a unified army” capable of standing up against “criminal tyrants and deviant extremists.” The former is a reference to Bashar al Assad’s regime, while the latter is a reference to the Islamic State, an al Qaeda offshoot that is opposed to Ahrar al Sham, Al Nusrah and the other coalition members. 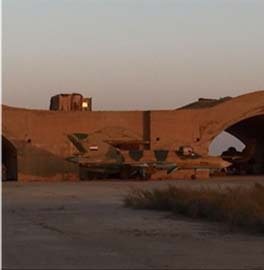 Can Jaysh al Fateh’s success be replicated elsewhere? It remains to be seen if the Jaysh al Fateh model can be successfully applied in other areas of Syria. Another prominent rebel group, Jaysh al Islam (Army of Islam), has accused Al Nusrah of allowing Islamic State fighters into the Yarmouk refugee camp on the outskirts of Damascus. 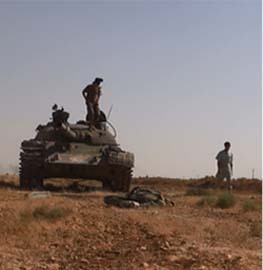 Jaysh al Islam has been battling Islamic State jihadists inside the camp. After denying there was any conflict with Al Nusrah earlier this month, Jaysh al Islam issued a statement on its Twitter feed accusing Nusrah of allowing Islamic State fighters into Yarmouk while denying entry to the Islamic State’s Islamist opposition. In a separate tweet in Arabic, Jaysh al Islam claimed that bloodshed between Ahrar al Sham and another faction was narrowly averted after Zahran Alloush, who heads Jaysh al Islam, stepped in to resolve a conflict. There have been regular reports of conflicts between the various insurgency groups in the Eastern Ghoutah countryside outside of Damascus, where Jaysh al Islam, Al Nusrah, Ahrar al Sham, and other groups all operate. This rebel infighting led Al Nusrah to an issue a statement on April 8, again calling for unity in the fight against Assad. “We call on you to unite your ranks… and focus your energy on destroying the Nusayri enemy,” Al Nusrah Front said in the message, which was released on its “correspondent” Twitter feed for Damascus. Al Nusrah concluded the statement by saying the rebels outside of Damascus “have an excellent example in your brothers in Idlib and Dara’a.” The reference to Idlib is a nod to Jaysh al Fateh’s success there in recent weeks. In Dara’a, a southern province in Syria, Al Nusrah has cooperated with other groups to seize territory and regime checkpoints. It was not surprising, therefore, to see that Muhaysini was in the middle of the effort to unite the Jaysh al Fateh coalition. 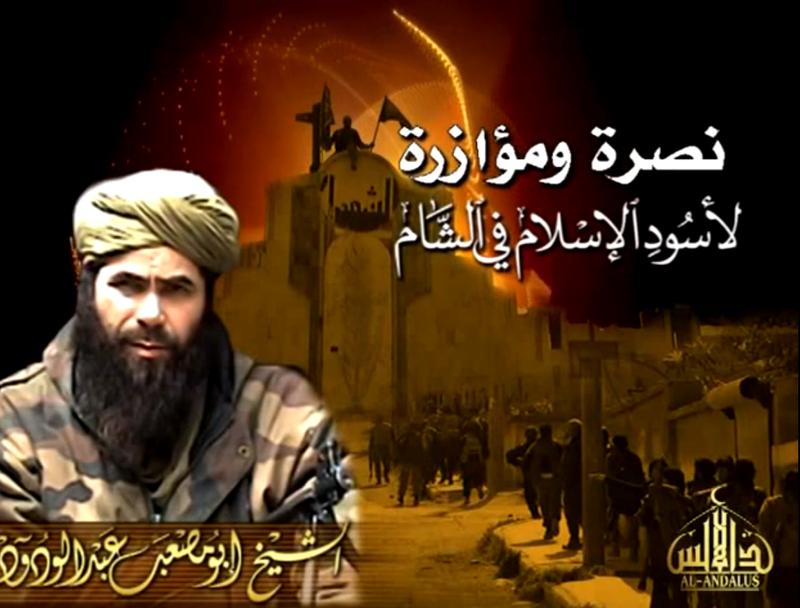 One graphic posted online, and retweeted by Muhaysini (as shown on the right), celebrated his role in Jaysh al Fateh while also portraying him as one in a long line of al Qaeda ideologues. It was also not surprising to see Muhaysini praise Droukdel’s message on his official Twitter feed. Droukdel, like other senior jihadists, knows that al Qaeda’s best chance for success in Syria is to have Al Nusrah deeply embedded within the anti-Assad insurgency — not opposed to it. I dare say the close proximity to the Turkish border might have had a significant impact with regard to massing and ordinance, but fair enough, Erdogen is not a stick in the mud he’s on the move , the tap can be shut off , its his decision, that would leave these blaggarded brigands with no place to be alive in.